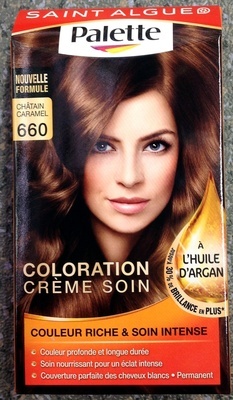 CRÈME COLORANTE : Aqua, Cetearyl Alcohol, Ammonium Hydroxide, Glyceryl Stearate, Ceteareth-20, Prunus Amygdalus Dulcis Oil, Octyldodecanol, Sodium Laureth Sulfate, Toluene-2,5-Diamine Sulfate, Parfum, Sodium Cetearyl Sulfate, Serine, Oleic Acid, Ethanolamine, Sodium Sulfite, Potassium Stearate, Glycerin, Tetrasodium EDTA, Resorcinol, Carbomer, Aragania Spinosa Kernel Oil, 2-Methylresorcinol, 2-Amino-3-Hydroxypyridine, Potassium Hydroxide, Ascorbic Acid, m-Aminophenol, Linoleamidopropyl PG-Dimonium Chloride Phosphate, Propylene Glycol, Sodium Sulfate, Linalool, Benzoic Acid. 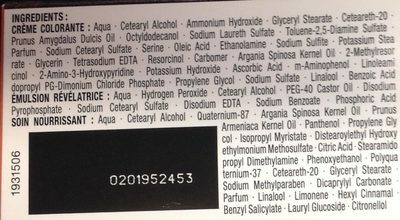 ÉMULSION RÉVÉLATRICE : Aqua, Hydrogen Peroxide, Cetearyl Alcohol, PEG-40 Castor Oil, Disodium Pyrophosphate, Sodium Cetearyl Sulfate, Disodium EDTA, Sodium Benzoate, Phosphoric Acid. SOIN NOURRISSANT : Aqua, Cetearyl Alcohol, Quaternium-87, Argania Spinosa Kernel Oil, Prunus Armeniaca Kernel Oil, Panthenol, Propylene Glycol, Isopropyl Myristate, Distearoylethyl Hydroxyethylmonium Methosulfate, Citric Acid, Stearamidopropyl Dimethylamine, Phenoxyethanol, Polyquaternium-37, Ceteareth-20, Glyceryl Stearate, Sodium Methylparaben, Dicaprylyl Carbonate, Parfum, Linalool, Limonene, Hexyl Cinnamal, Benzyl Salicylate, Lauryl Glucoside, Citronellol. Product added on June 2, 2016 at 2:54:39 PM CEST by teolemon. Last edit of product page on April 13, 2018 at 10:44:10 AM CEST by tacite. Product page also edited by scanparty-franprix-05-2016, tacite-mass-editor, tib-de-bar.